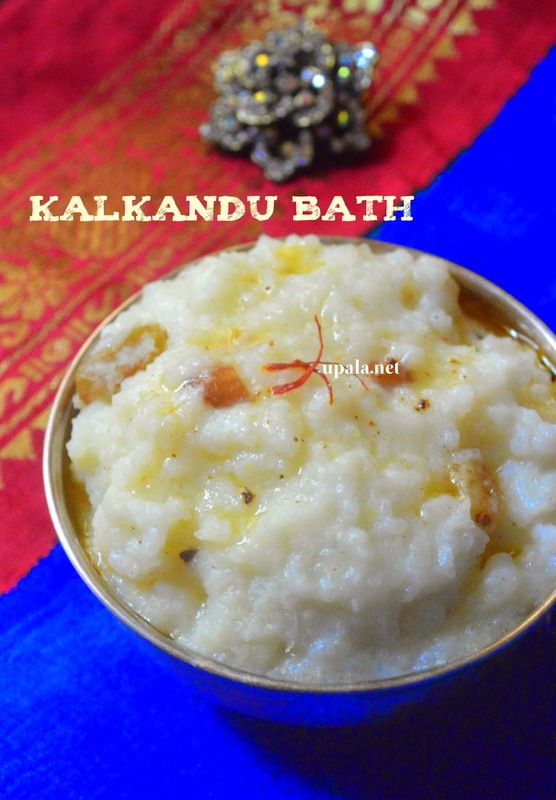 This fantastic white coloured Kalkandu bath/Kalkandu pongal/Kalkandu Sadam is a Delicious Indian dessert made of Kalkandu/Rock candy and Rice. 1) Wash and clean the rice, add 3 cups of water and 1 cup of milk. Pressure cook for 4 whistles. 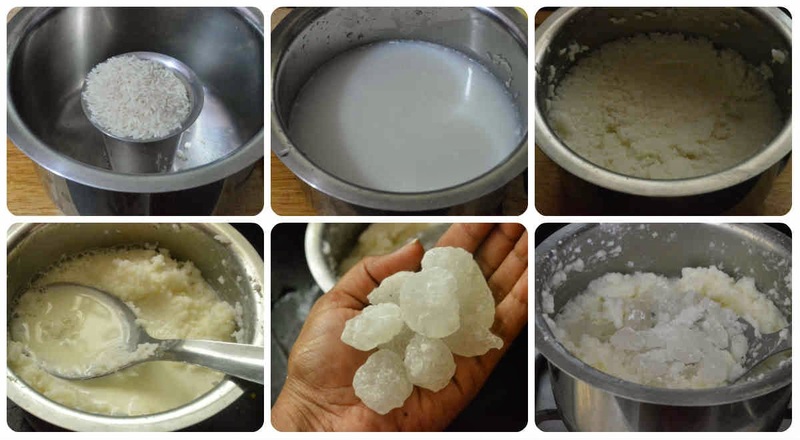 2) After the pressure subsides, add 1 cup milk +1/2 cup water to cooked rice and mash it with a ladle. 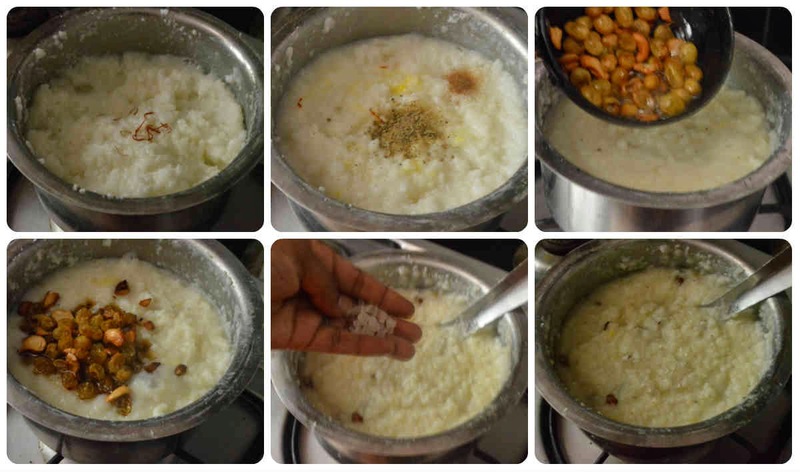 3) Add Kalkandu to the rice and switch on the stove to medium flame. 5) Leave it to cook for few minutes, also occasional stirring is needed to avoid getting burnt. 6) Add Saffron, mix well to leave its colour in kalkandu bath. Let it cook for few more minutes. 7) Next add Cardamom powder, Nutmeg/Jathikai powder and mix well. 8) Meantime heat 1 tbsp Ghee in a kadai and add Cashews to fry till light brown. Next add Raisins and fry till they puff up. 9) Pour this mixture on top of kalkandu bath and switch off the flame. 10) Finally add 1 tbsp of Diamond kalkandu, 1 tbsp of Ghee to this bath and mix well. 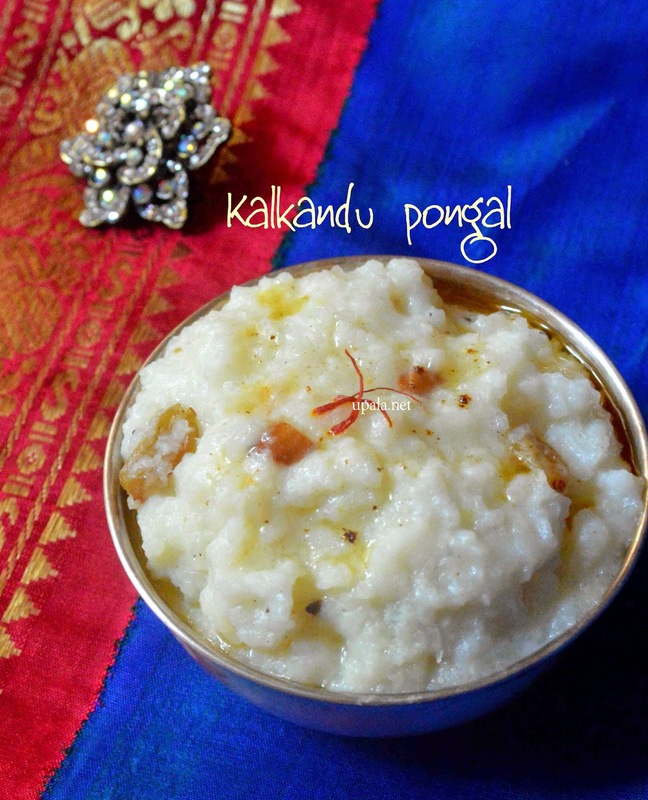 Yummy Kalkadu pongal is ready...while serving sprinkle few diamond kalkandus on top of pongal to enjoy the tasty pongal along with crispy kalkandus. 1) If you don't have Nutmeg powder, grate it and add. 2) Instead of Rock candy you can also add Diamond kalkandu. 3) Make sure at the final step the kalkandu bath is little watery consistency, it will thicken after sometime.